I wanted to share my Birthday party with y'all. 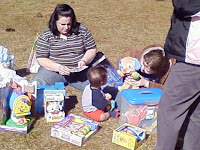 I turned one last Friday and we had my party on Saturday, at a small play-ground. It was great fun. Not that it made much sense to me. 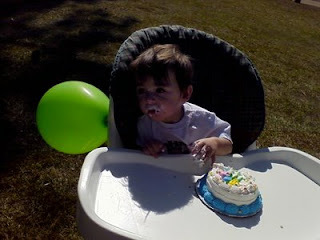 I still am not quite sure, why I got all those new toys, but I sure loved the cake! I had it all to myself. I did not really know what to do with it at first, but mom showed me. She grabbed my hand, pushed it in the cake and gave me a taste. Well, after that there were no more questions on my part, haha. I dug in with both hands, iced my mouth, eye-lashes and even my hair. Oma did not mind all that mess. When I was determined to get out of my chair, she just lifted me out and I got it all over her as well. She said, I was a 'sweet' boy, literally and asked if she could get some sugar. I don't know what she was laughing about. After having consumed one of the little iced cup cakes, Opa had to point out to her, that there was icing showing at the corners of her mouth. Geezzz, Oma. That is the typical pot, calling the kettle black. Grin. Big brother enjoyed the cup cakes as well. At least the icing on the cake. 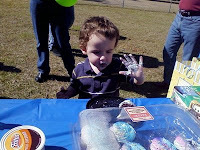 After having munched off the colored icing and eaten half of it, he took a shot at the other cakes and managed to scoop up a handful of that sweet blue substance. Oma thought he looked like a smurf afterwards. Look at all the toys I got! Or rather, we got. Kc got some as well and it was not even his Birthday yet. Nope, he has to wait 6 more days and then.... Party Time again! I so hope we go to the same play-ground. I loved the swing, but most of all the slide. It was electrifying. But that is another story, hehe. Y'all have a great and blessed day now. This 'sweet' boy is still trying to come down from his sugar-fix. Grin. Even though, he may not entirely have grasped the concept of what a Birthday means, he enjoyed it. There is no doubt, that he will eventually learn. Especially, when it is presented in such a pleasant way. The wise in heart will be called prudent, And sweetness of the lips increases learning. Corry - can't believe it's been a year already! I know, I can't believe it either. Time flies huh?! Happy 1st Birthday my Little buddy ! Don't feel bad cause I call Lit'l KC my buddy too ? Grandpaw Ron has got enough room in his big ole heart for 2 or 3 more dozen just like ya'll ? Now that you are one year old you will have to tell Mommy and Oma to start looking for you and lit'l KC some more company to share all the fun that ya'll are having ? They say the more the merrier ? I will say that ya'll are gona be a pair of exciting little boys and maybe Mommy -- not Oma and Opa will spoil ya'll ? That cake sure looks good and proud ya'll made memoirs ? Keep them big ole smiles coming and you will continue to get Oma's approval [tip of the day] ? I am not jealous, because you call my brother lil bud too. I am actually glad and honored to be your bud as well. I would be getting worried if you didn't, hehe. We had a few friends to play with, but lost track of them because of the moving. I am sure, we will make some new ones soon. If not... I always have my brother to pester. Oops, that applies for him as well. I better watch my step. Grin. Have a very blessed day and tell the girls 'hi' from Oma. Yeah, 1 down, 20 more to go. I am counting down. Or is it up? Hmmm, dunno. (((HUGS))) back and have a great and blessed day as well.